Habit at Munro Trail, Lanai, Hawaii, USA. April 05, 2007. Altitude range: It grows at elevations of 490–670 metres. Habitat and ecology: It can be found in in remnant dry forests and on rather steep slopes. It is threatened by habitat loss. 400-1000 of these plants remain in the wild, but little recruitment has been observed in the past 10 years. The reasons for the lack of recruitment are unclear. Description: Dracaena fernaldii, also known as Pleomele fernaldii, is an erect, perennial, herbaceous plant, forming large shrubs or small trees with few dichotomous branches 6-8 m tall. The sessile linear leaves are born in dense rosettes, followed by yellow flowers in terminal pendulous racemes and globose compressed 3-lobed berry. It is cultivated as a garden and indoor ornamental plant. Derivation of specific name: The specific epithet fernaldii was named by Harold St. John, professor of botany at University of Hawaiʻi Mānoa, in honor of his principal botany teacher, Merritt L. Fernald (1873-1950). Stems: 5-8 m tall (or more), 1.5-2 dm in diameter at base, the branches few, dichotomous, gray, roughened by the short, raised int,ernodes; youngest branchlets just below the foliage, 12 mm in diameter, pale yellowish brown, half ringed by the pale, transversely linear leaf-scars. Leaves: Medium to dark Green glabrous (without hairs), spirally arranged, spaced along distal part of stems, sessile. Lamina sword-shaped to tongue-like, more or less leathery, 12-21 cm long, 9-14 mm wide. Margins paler and cartilaginous. Inflorescence: Terminal, solitary, paniculate, usually recurved and pendulous. Peduncle 8-10 cm long, 7-8 mm in diameter, with leafy-bracts. Panicle 25-32 cm long, 12-20 cm in diameter. Rachis glabrous. Pedicels 4-12 mm long. Flower: Showy yellowish-green or greenish-yellow. Perianth tube 15-19 mm long sub-cylindrical constricted in the middle 5-7 mm in diameter. Perianth lobes 9-11 mm long. Filaments exerted, 10-11 mm long, , anthers 3.5- 4 long, pale-yellow. Ovary obovoidal green, stile 23 mm long thread-like, stigma truncate, minutely 3-lobed. Fruits (berries): Bright red and roundish somewhat depressed, (one-)two- or three-lobed, 5-10 mm long, 10-17 mm in diameter, pulp fleshy, skin cartilaginous. Seeds: Globose 4-8 mm in diameter pale brown. Phenology: Flowering spring; fruiting in summer. 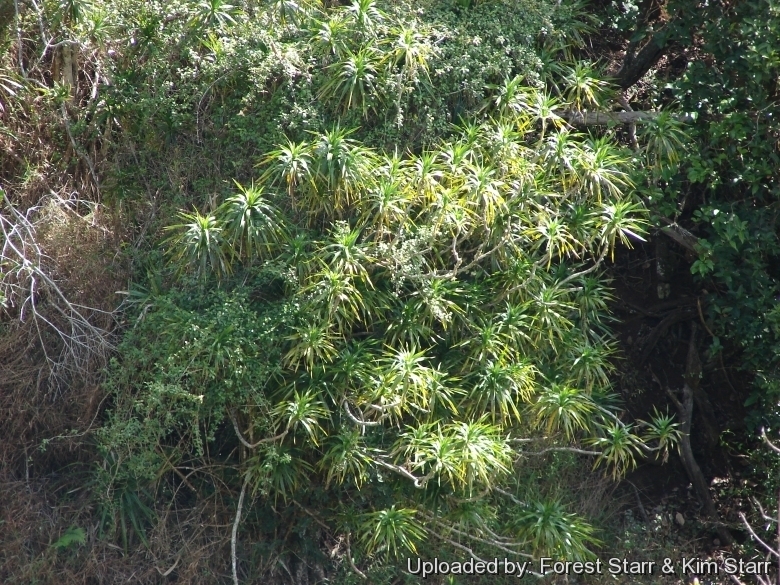 Similar species: It seems this species most resembles Dracaena aurea and Dracaena forbesii and was erroneously attributed to them by early botanists. Petals are slight to fully recurved (folded back), unlike some other species such as Dracaena aurea, Dracaena forbesii and Dracaena halapepe, which are slightly or not at all recurved. 1) Forest & Kim Starr “Pleomele fernaldii (Halapepe)”. Plants of Hawaii. <http://www.starrenvironmental.com>. Web. 19 Jan. 2015. 2) World Conservation Monitoring Centre 1998. Pleomele fernaldii. The IUCN Red List of Threatened Species. Version 2014.3. <www.iucnredlist.org>. Downloaded on 19 January 2015. 4) Wikipedia contributors. "Pleomele fernaldii." Wikipedia, The Free Encyclopedia. Wikipedia, The Free Encyclopedia, 2 Jun. 2013. Web. 19 Jan. 2015. 6) Harold St. John "Pleomele fernaldii (Liliaceae), A New Species from the Hawaiian Islands," pages 39-42, and Plate III. 7) J. Juvik, J. DeLay, M. Merlin, M. Castillo, L. Perry, K. Kinney "Endangered Plants and Threatened Ecosystems on the Island of Hawaiʻi" page 30. 8) Harold St. John, "Monograph of the Hawaiian Species of Pleomele (Liliaceae)," pages 171-189. 10) Rev. Kaluna M. Kaʻaiakamanu "Native Hawaiian Medicine--Volume III" , pages 47-48. 12) Pei Luen-Lu and Clifford W. Morden "Phylogenetic Relationships among Dracaenoid Genera (Asparagaceae: Nolinoideae) Inferred from Chloroplast DNA Loci", pages 91, 101. Cultivation and Propagation: Dracaena fernaldii (Pleomele fernaldii) is drought tolerant and adaptable but seldom cultivated as an ornamental tree for parks, gardens, but has the potential to become a beautiful native plant replacing he much used money tree (Dracaena marginata) seen in Hawaiian landscapes today. It will grow in warm subtropical or tropical climates and prefers dry conditions. It appears to be easy-to-grow and rewarding and establish at low elevations with very little extra care or watering required. But young plant are happy growing indoors. Fertilizing: Fertilizers can be used in light amounts. Apply general garden fertilizer (10-30-10) including all micro nutrients and trace elements or slow release fertilizer to the planting bed at 3-month intervals during growing season, and to container plants at bimonthly intervals. Exposure: Full or partial sun. In its natural habitat the Lānaʻi hala pepe (D. fernaldii) can be found in bright light to full sun conditions. Water Requirements: This Dracaena does best with waterings when dry. Water regularly during the active growing season from March to September, but do not overwater this plant. No water should ever be allowed to stand around the roots. Keep quite dry in winter. Hardiness: This spurge has tolerated temperatures down to –0ºC. However it can be difficult to get it to look its best without a good amount of heat and sun and so it is only really suited to the tropics (USDA Zones 10-11). Keep the plant cooler in winter, but maintain the light as bright as you can so that any growth which it may produce at this time will not be etiolated. It can be grown outdoors in the summer months to benefit from direct exposure to light, and especially exposure to high summer temperatures. *Pest & Disease: Hala pepe is prone to scale and root chewing arthropods attack young plants. Corn worms attack roots. Also root rot and Cyrcospora fungal crown rot. Too much much water can cause fungal rot and kill the plant. It needs dry conditions to avoid rot. Pruning: None necessary, except to remove dead lower leaves and spent fruit stems (panicles). Drastic pruning usually disfigures the plant. Medicinal: Early Hawaiians used the leaves in bathing and steam baths for chills (liʻa), headaches, fever, and thought to stop burning temperature or sensation. Religion: The soft wood was used by early Hawaiians to make idols and to decorate altars. Modern Use: Leaves and flowers are used in lei making today.